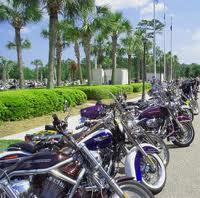 If you’re coming for the Myrtle Beach Bike Week Fall Rally being held from October 1-7, 2012, you’re probably looking for the perfect condos in North Myrtle Beach where you can stay. Check out our website to see what we have available at Grand Strand Resorts. We always have deals going on and rates are beginning to fall on these condos in North Myrtle Beach as the off-season approaches. It’s an awesome time of the year to have the bike rally and if you get a chance you should try to experience some of the phenomenal golfing available in the area. There are more than 110 championship courses in the Grand Strand area alone! There’s sure to be more than a few that match your skill level and provide the challenges you want. Don’t miss the 5th Annual Fish Fry Benefit for the Special Kids Sponsor Program on Wednesday October 3rd, 2012, hosted by Babb Construction. The benefit will be in the Old Hooters Parking Lot (13th Ave. N) just off of Hwy. 17 in NMB, SC from 11 a.m. – 2 p.m. Tickets are $6.00 per plate (Fried Fish, French Fries, Coleslaw, and Bread). As the largest fall motorcycle event in the Carolina’s, there will be many events held at various locations in the Grand Strand region. 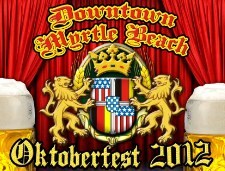 Among the events is Oktoberfest 2012 happening in downtown Myrtle Beach on Saturday, October 6 from noon until 11 p.m. Enjoy authentic German food, beer and wine, an alcohol-free kid’s zone with inflatables and street performers, and a bratwurst eating contest. Free live concerts are all day long and will feature Trombone Shorty & Orleans Avenue.